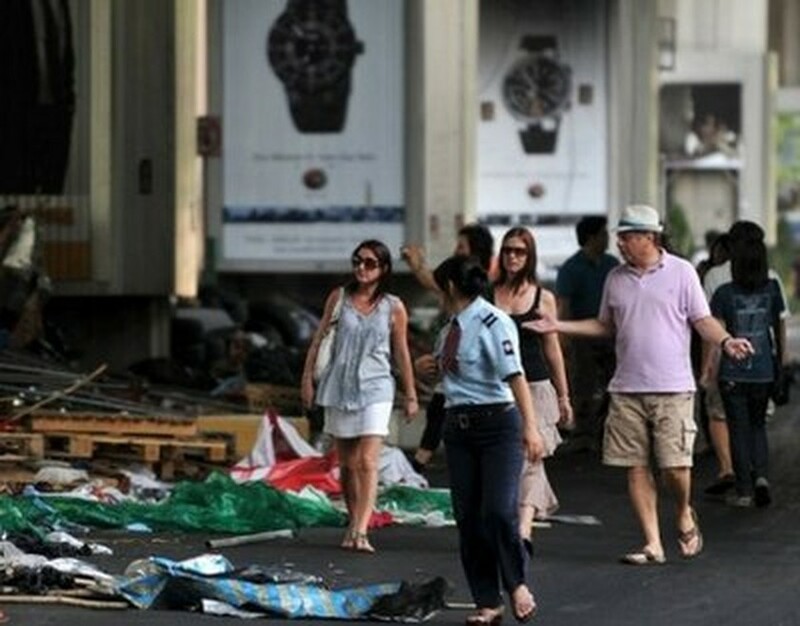 Tourists walk through a street strewn with rubbish in central Bangkok on May 22. Thailand's premier said Sunday the capital was calm and returning to normal after a massive clean-up, and defended a crackdown on protest rallies that unleashed a rampage of arson and looting. Prime Minister Abhisit Vejjajiva said that schools, streets and government agencies would reopen Monday after being shuttered to keep civilians out of central Bangkok during clashes between security forces and "Red Shirts" protesters. "Everything is calm and returning to normalcy," he said in his regular Sunday television address, appearing relaxed and confident as two months of crisis abated. However, he indicated that a curfew in force for four nights in Bangkok and 23 other provinces could be extended for another two nights. Squads of workers were out on Bangkok's thoroughfares, completing a campaign to remove tonnes of debris and garbage after Wednesday's offensive on a protest encampment that had paralysed the top shopping district for six weeks. The security checkpoints, road closures and rolls of razor wire were being scaled back as Thailand prepared to get back to business after the civil unrest that has left 86 dead and 1,900 injured. Abhisit defended the security authorities' conduct in the final crackdown, which left 36 major buildings torched when enraged militant Reds went on the rampage after their leaders were forced to surrender. "The losses (of life and injuries) were caused by clashes between groups of people attacking authorities' efforts to set up checkpoints to secure the area," he said. "All weapons use was based on international standards. Weapons were used for self defence and to establish peace and order." The government on Saturday displayed a huge cache of weapons it said had been collected from the ruins of the rally encampment, to quash criticism from international rights groups as well as the Reds who said they were unarmed. However, Abhisit admitted there were serious concerns over fighting at a temple within the Reds camp which had been designated a "safe zone" but where six bodies were found after the chaotic protest dispersal. 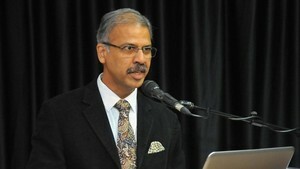 "The most distressing were the deaths at the Pathum Vanaram temple," he said, maintaining there was no military action at the time of the shootings but that the events would be investigated by an independent committee. Concern has been growing over rights abuses in Thailand, with the European Union the latest to call on the authorities to respect the rights of protesters and saying the violence had harmed the nation. Human Rights Watch has also expressed alarm over a "draconian" emergency decree introduced during the crisis to hold prisoners in secret detention. Abhisit has admitted that Thailand faces "huge challenges" in the aftermath of the rally campaign by the Reds, who are pushing for fresh elections and condemn his government as illegitimate. The Reds are mostly supporters of former prime minister Thaksin Shinawatra, who was ousted in a 2006 coup. The billionaire was accused of gross rights abuses and corruption, but won grassroots support with his populist policies. Thaksin's elected allies were later ejected in a controversial court ruling, paving the way for Abhisit's administration to be appointed in a 2008 army-backed parliamentary vote.